52-41? You mean the Hogs lost? Are mommy and daddy going to be in a bad mood all day Sunday? Thank goodness my grandparents came by today and kissed me a bunch. They are a lot of fun - they think I'm super cute and I can't do anything wrong. They kept me while mommy and daddy had a lunch date. I never even noticed they were gone because my grandparents oohed and aahed over me so much. They are nice. Mommy said she was a little sad to be staying home tonight and not going to the game but I think she changed her mind after it was raining and then when they lost. She made me go to bed during the first quarter but not before she did a lot of screaming and yelling and jumping around. She made me laugh a lot - I just kept staring at her because I've never seen my mom act like that. Football must be very exciting. Even more exciting than Sonic drinks or fried pies. I can't wait until my daddy takes me to a game! Oh well - Mommy says we will beat Alabama next week. I like Alabama - that's where I got to go swimming in the ocean but Mommy says we need to beat the Crimson Tide. I was going to wear my victory Razorback dress to church tomorrow but now mommy has to find me something else to wear. I'm trying to decide whether I should be sweet at church or do a lot of crying. I guess we'll find out tomorrow! Goodnight everyone! It's about time for me to wake my mom up again! I'm hungry! What a game! I thought about you the whole time! Good luck next week....We are Auburn fans, so anyone team that handles the tide is a friend of ours! Ha ha!! hahaha!! Great post! Sorry they lost, but hope you had a nice lunch date! Hope tomorrow goes smoothly!! what a great game. the hogs have no reason to hang their heads. bama looked good this week so the hogs may have their hands full next week. good luck!! It's great...to be...a Georgia Bulldawg!!! Sorry, couldn't help but rub it in just a bit! :-) Have a great Sunday! Girl, you crack me up! We are so much alike it's not even funny! I had to explain to my two year old today that Mommy was not mad/screaming at her...just at her Huskers. She was looking at me like I was a nut! Sorry about the loss tonight, but I feel your pain today. At least you know Harper looked precious in her gear! Hope she's getting some use out of her "Lil Hogs Fan" sign! I need to make her one of my new updated ones! I can't say it enough--she is getting more and more beautiful by the day! that game was awesome! as much as i love your blog and adore that sweet little girl of yours i gotta say GOOOOOOOOOOOOOOOOO DAWGS!!! We have that same "smallest fan" onesie!! And the "fan since birth" and I can't remember what the other one says. I am so sad! I can't believe they lost. We were yelling quietly as to not wake the sleeping baby in the next room...which we did...a couple of times...ugh!!! I was pulling for y'all tonight! But you need to take back that comment about next week. :) Roll Tide!! Too bad your guys lost! This post idea was so cute! Love the look on Harper's face in the first picture. As for 'Bama versus your guys next week, we'll be rooting for opposite teams this time around! That game was so intense! I was screaming at the TV the whole time. Your hogs put up a good fight, but in the end they were no match for my dawgs! GOOOOO Dawgs! Sic'em! woof woof woof! Oh sweet Harper you are absolutely adorable in your outfits. Your Mama sure knows how to dress you. But you know what, honey? Trying saying "Roll Tide". See there? It rolls off the tongue. Much easier than sooooiiiee or whatever that is that your Mama has you sayin'. I thought about you tonight when Annabeth didn't even make it through the first quarter of the A&M game. You did the right thing! I was laughing about the fried pie thing. So funny! Had a bit of a different ending here...I still can't believe it, but UW BEAT USC! These verses are so comforting. Continuing to pray!!!!!!!!! Revelation 21:1-4 And I saw a new heaven and a new earth: for the first heaven and the first earth were passed away; and there was no more sea. And I John saw the holy city, new Jerusalem, coming down from God out of heaven, prepared as a bride adorned for her husband. And I heard a great voice out of heaven saying, Behold, the tabernacle of God is with men, and he will dwell with them, and they shall be his people, and God himself shall be with them, and be their God. And God shall wipe away all tears from their eyes; and there shall be no more death, neither sorrow, nor crying, neither shall there be any more pain: for the former things are passed away. my husband is glad he didn't go too. he told me to throw away all his razorback shirts. i said, then you won't have anything to wear. he'll change his mind. Harper, you are so cute! My bet is that your mommy and daddy wont be able to stay upset for a minute when they see your sweet little smile! Sorry about the game..... Next week. I thought of you today when I was looking at the Better Homes and Gardens magazine and they had a recipe for fried pies! Oh Kelly, I have to disagree with you just once! Little Harper looks so beautiful in red and white and would look even more precious with an Elephant on her shirt rather than that old razorback :) Have a good weekend! ROLL TIDE!!!! Such a great blog Harper! I am so sorry that those dawgs took a bite out of your pigs...well they about ate them up!! Ha! I thought about you during the entire game!! Sorry but I was hoping for those dawgs to win!! You have a good day and do behave yourself at church!! You are to precious to cry!! if it is any consolation, your Hogs had my Dawg fan of a husband sweating it out until the very end! Harper looks super cute in her Razorback outfits! We watched the game. It was very exciting. I guess we have to move on from this game and get ready for Alabama! Harper...You are such a wonderful writer! I just love reading your post! So adorable! 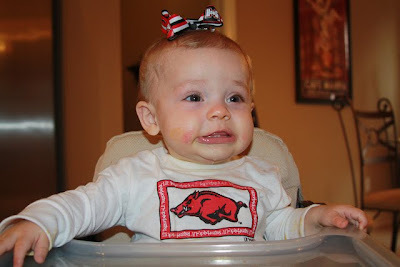 Harper looks so cute in all her Hogs gear. I'm sure she thought you were really entertaining and will want to be just like Mom in a couple years. I think you've got a Hogs fan for life! Sorry about the loss :( At least Ole Miss won! See ya on the field next week! Too cute, I came across the game and thought of you :( Harper is a great blogger already!!! Too cute! My Samuel did a lot of laughing at mommy and daddy yesterday too....BUT my Tarheels and Hokies won! Sorry bout your Hogs. Seriously, she just gets cuter every day! Loved the story and I am glad that she enjoyed her first Hogs game! I'm sure there will be many, many more in her future!! So cute! Love life from Harper's perspective! That is just precious, Kelly...I mean Harper!!! :) Too cute. I'm so sorry that they lost last night. I can only imagine how sad you were. Okay, I guess I don't really have to imagine ~ I just know! Anyway, YES the HOGS will beat Arkansas next week! You're little girl is so precious! I was just wondering if you would mind sharing what kind of camera you use to take all of her adorable pictures? Im not much of a football watcher, and even though I live in Georgia I was hoping the Hogs would win all day just for you and your family! Next game- go Hogs! What a cute post! Sorry your team lost but it is GAME ON next weekend, Kelly! :) ROLL TIDE ROLL baby!!! PS: That will be the only week of football season that I do not hope your team wins by the way! I love Harper's facial expression in the first picture! She's adorable! I hate that your Hogs lost, my Vols lost too but not as bad as we thought they would! She is so sweet and precious! Love the look on her face in the high chair! Hoping y'all beat Bama too! you won't beat Alabama!!! Got to show my love for Bama!! ROLL TIDE!!!!!!!!!!!!!!! I'm so glad we have a decent QB this year - but where was our defense!??? It was a great game to watch though. Lets just hope the the Hogs wore Georgia out so they are beat by ASU on Thursday! Go Devils! The Hogs lost last night, now hubby is grouchy today. The price we pay when those dadgum Hogs LOSE....sheesh! I really thought the Hogs were gonna pull that one out! What's up with 2 SEC teams putting up so many points? They looked like Big 12 teams last night!! Harper is such a doll baby! Even if her mama makes her wear those P-I-G outfits!! ha! Cutest blog post ever!!!!!! Loved it! Super sad about our Hogs losing, but I'm super impressed that we have a passing game! Happy Sunday. Harper is just adorable :) I absolutely love the headbands...when I have a little curly-haired daughter...she'll be rockin' the headbands too! Any Kelly followers need a blog makeover? I'd love to work with all of you! I gotta say it.... ROLL TIDE!!! Too cute! She is adorable! That was such a close game. I was on the edge of my seat! Can't wait until I have a little girl to dress in cute Bulldog outfits! Kelly, I am SOOOO sorry your Hogs lost. I was cheering for them. Made me think about you and your precious Harper. My CATS won, but not in SEC play. They played the team I hate most on earth, University of Louisville. Hope your Hogs give Bama and run for their money and completely wear them out. We play them the next week, so if your Hogs can have them wore out and sore, that would help us out!! How funny! and cute as well... you are so cute Harper...winning game or not...you were too cute! I am an Aggie and I hardly ever get to do the victory dance these days but I sure do wish I looked that cute in a big bow! Oh my goodness this it too cute! Harper, you are the cutest little Razorback fan I've ever seen! But sadly you are wrong about next week. :-( I'm afraid that victory dress will still be hanging in your closet and your sweet mommy will have to find something else for you to wear to church. My 2 year old Allie (whose middle name is Harper!) would love to teach you how to say ROLL TIDE! It's a shame that we dress our daughters on Sunday based on how our favorite teams perform the day before! I wouldn't let Alise wear her smocked Bama dress to church today because I'm saving it for her to wear after we win next week!! Roll Tide!!! Kelly, I loved this format of blogging. Tell little Miss Harper to keep up the good work. Aw, this is the sweetest post! Love it!!! Little Miss Harper, you sure are a cute Hogs fan but I am afraid to tell you that your mommy and daddy will be doing the same crazy dances next week. Mommy needs to go ahead and find you something else to wear to church next week too. But You are the most gorgeous football fan I have ever seen:) Roll Tide!!! Cute Cute Cute! I so wanted to email you during the game (yes, I realize you have no clue who I am) since I'm a dawg, and I think you love football as much as I do! Y'all played great; Mallett was on fire!!!! He's a stud! Great game, though. Looks like you girls had a great day! I thought about you, too...but I can't say I'm sorry! We're Dawgs in this house! Love your blog! Sorry about the Hogs' loss, but Harper is PRECIOUS (as usual!) 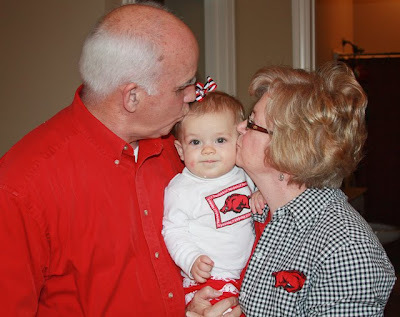 Love the pic with her grandparents kissing her! :) So glad they are close and can come often. It's very hard for my parents to be over 1000 miles away from their only grandchild, my niece. Thankfully there are digi pics and e-mail! Hope Miss Harper was a good girl in the nursery today! Super cute post!!! I was pulling hard for the Hogs even though I'm a former GA girl! I was equally as sad that my beloved Vols lost though. Girl, we're ready for you!!! Bring Harper this way and we'll get her fixed up in some Crimson and houndstooth! Roll Tide! Tell Harper she'll have to keep her victory dress in the closet one more week! Ahhh...too cute! I love it! Except that our Hogs lost. Hopefully next week will be better! this post was SO SWEET, great idea! I will be pulling for the Hogs next week - probably harder than some Arkansas fans! Why? Because I'm an Auburn grad! WAR EAGLE!!! Oh Kelly - I wish ya'll would have won yesterday! The hubs and I were catch in the monsoon at the Auburn game yesterday! What a night it was!! I will REALLY be cheering for yall this next weekend against Alabama. I love the SEC and anyone that beats Alabama! Hello, I've been away for awhile. Praying that all things are well. Harper looks precious in her outfit!! So glad precious Harper loved Game Day:) Praying she had a great day today. Gotta LOVE the SEC!!!! Your Hogs played the heck out of that game against my DAWGS!!! GO UGA!!!! Hopefully ARKANSAS will ROLL right over BAMA!! Harper looks adorable and so happy! Aren't Bama Fans hilarious?? Love your post. That Harper of yours is just too precious!! Here's luck to the Razorbacks next weekend. We shall see about that! ROOLLLL TIIIIDDE! So sorry your Hogs lost, but Harper sure is adorable in her Hog outfits. I know you can't wait to take her to a game. By then she will be used to seeing crazy people yelling and calling the hogs. Sound like someone you know? So sorry that your beloved team lost. Oout Tigers pulled another one out! But I'll be yelling Whooo Pig Soooeeee with you next week. We'll pull for anyone who is playing Bama!!! War Eagle!!! Have a great week! Love, love Harper's face in the pic! Your writings are so animated and fun! As a fellow Hog fan, where do you find all the precious outfits Harper is wearing? My hubby, daughter, and son-in-law would be in ...mmm...hog heaven!!!! So happy Harper did so well with her surgery! You have no idea how your blog brings so many smiles!!! Hi Kelly! I really hate to say this, but......GO DAWGS!!! SICK 'EM! Ha! It was so funny, when we were watching the game I was thinking, Kelly is going to be so sad! It's pretty funny when your thoughts start revolving around blog friends! Have a great day! Harper, poor sad Harper, its okay. I'll still be your friend even though my daddy's team is going to win on Saturday. Mommy has my new Alabama cheer outfit ready to go and a new red dress for church on Sunday! Roll Tide! Your friend, Sarah (10 months). So I couldn't help but think about you while we watched the game and when "WE" won, I was like, OOHHHHH I bet Kelly is gonna post something! LOL. Harper.. you are such a cutie! I love your little Razorback onesie but I must say ROOLLL TIDE!!! you crack me up!! What a cute post. Thanks for the post Harper!!! Soon you can have YOU OWN blog!!! Soooo cute! Ha ha funny and SO CUTE! You did such a great job on your post today!! What a writer!! I love your first picture in this post and then the first one in Hogs vs Dogs! You are so cute! UUUUMMMMM...not so much!!! haha, love you girl! OHHHHH i LOVE it! so fun to read what you think harper is thinking! Too cute! And that first picture of her! PRICELESS! =) Sorry the hogs lost... here in WA, the Huskies FINALLY won!!! YAY! =) Enjoy your week! Such a cute post! And I hope-hope-hope you beat Alabama next week! ahahah such a cute post! Harper is so cute in her little Hogs outfit! We watched the game and I thought about you and if you were jumping around and putting a show on for Harper! I bet she loved it! Cute post. We were screaming our heads off that first quarter - not so much the last. Sure looks like a different Hog team than in past years though. Love all that offense. The defense is gonna have to step it up. I love your blog, but I'll be screaming ROLL TIDE!!! We will be ROLLING all over those Hogs come Saturday!!! I love her darling little top too! she looks like a true fan. Hey, at least USC lost. Kelly, just gotta say "GO DAWGS!!!" Is it too early to start trash talking right here on the ole blog??? GO HOGS GO!! WOOOOOOO PIG SOOIE!!! This is probably just about the cutest post I have ever read! Great job Kelly! I go for you Hogs all the time except for when they play Alabama! My husband is a huge Alabama fan. Sorry my friend :(. But I am only cheating this once! Hi Kelly! I totally thought about you last Saturday during the game. I had recently read a post where you said you liked the Georgia Bulldawgs except when they play Arkansas. We are Bulldawgs and bleed red and black. My husband played for UGA when we were in college so it is in our blood! Honestly, I can't believe we won but it was a pretty good game! Anyways, I just wanted to say hi and I'm not rubbing in the win at all. Just wanted to say hi and say I'll be rooting for you guys next week too! Oh, and Harper is a doll in her SEC clothes! Your Hogs held their own pretty good against our Dawgs. Hubs says our defense is terrible. We were at Disney World & he was in the room watching the game.